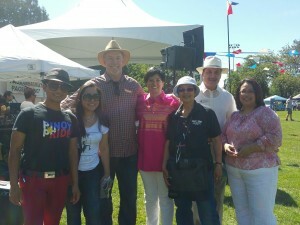 Philippine Independence Day at Memorial South Park in East Vancouver with Leader John Horgan, MLA Raj Chouhan and friends. “As Filipinos celebrate the 118th Anniversary of Philippine Independence Day, we join them in marking this great occasion. The Filipino people have shown remarkable courage, fortitude and capacity for hard work and enriching communities all over the world,” said Horgan. Said MLA Mable Elmore: “Canada in particular is now home to a large community of Filipinos who have put down roots, established thriving communities and are proud to call themselves Filipino-Canadians. “On this occasion, we extend congratulations and warm wishes to the Filipino-Canadian community as it celebrates this important event. Canada is home to a vibrant Filipino-Canadian community. However, steps still need to be taken to fully integrate Filipino newcomers. It is vitally important that we support the return to a model of permanent immigration to allow all Filipino workers to contribute and participate fully in building our province and country. “Alongside this, we also need to look at improving the recognition of foreign credentials to ensure all immigrants are able to contribute and benefit in being part of Canadian society.